Thanks, Bob Seger. We’re still struggling with huge winds out here in New Mexico. Stayed last night, April 16, at Turquoise Trail Campground, just east of Albuquerque. We had originally planned on staying two nights there, and seeing the sights in town, but became very discouraged with our travel. Decided to hang out for a night, get out of town, and leave Albuquerque for another year. Can’t tell you how much this awful wind is affecting us. The Fireball is filled with grit. The bed is gritty ;-((. We’ve swept and wiped off surfaces several times today to no avail. As I write this, the wind is 38mph, and blowing great quantities of New Mexico in thru any small crevice in the Fireball. It may even be blowing some of Arizona in – the wind is that strong. On the way to Turquoise Trail Tuesday, we stopped at Grants, NM and toured the NM Museum of Mining. 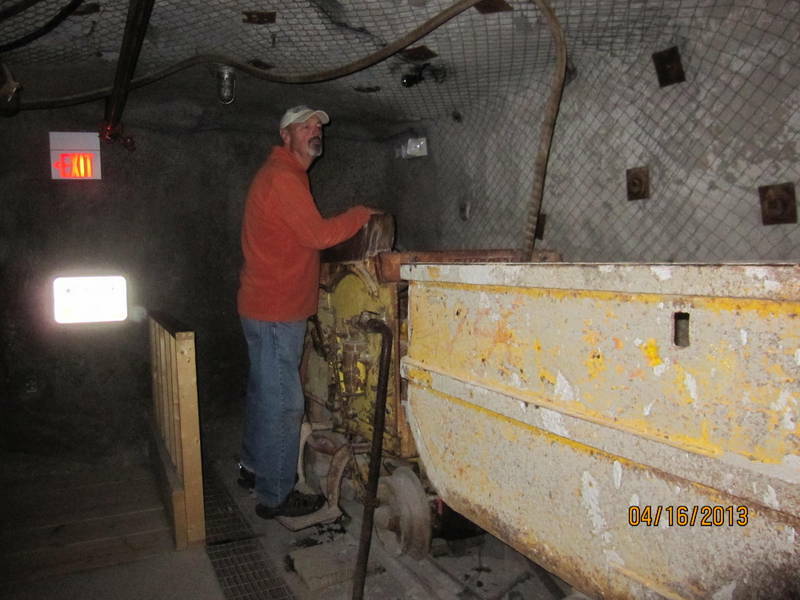 They have an underground tour which featured different stations and pieces of equipment. An audio narration of the work done by each piece was done by a retired miner. It was a really nice, fairly low-tech tour. The Grants area was the center of uranium mining in the 1950’s. It was enlightening to take the tour, and we’re happy that we took the time to get off the highway to do so. So often, the urge is just to press on, and get to the next destination. We’ve moved on to Santa Rosa State Park, only about 100 miles from last night’s campground. We’re holed up here for two nights, then on to Texas. This state park is near a lake/river/dam project, but there doesn’t seem to be much water. The nice long showers I used to take in Michigan seem to be only a dream – this trip has really impressed upon me how desperate the southwest is for water. We see so many dead trees – our campground host last night told us that he’s lost many trees in the past three years. Each year the residents here hope for an end to the drought. Our wishes are more immediate. STOP THE @#$&% WIND! Jezzy and I explored some of the trails in the Park after we landed here this afternoon (while John slept off the enormous lunch we had at Blake’s Lotaburger!). My hat, which had been clamped to my head so tightly that it made ridges on my head, suddenly was bouncing across the prairie (or desert, or plains – whatever it is here…). Jezzy and I were in hot pursuit, since it’s my favorite hat from Old Boys’ Brewery. Luckily, it snagged on a creosote bush, and I retrieved it, none the worse for wear. Winds are forecasted to be just 20mph tomorrow, although the temperature is going to drop a corresponding 20 degrees. Nonetheless, we are hoping to cycle into Santa Rosa for a tour. Santa Rosa is one of the old Route 66 towns, with many historical sites. It would be a shame to have drive, and leave our bikes in the truck. Not many photos to post – who wants to look at flat blowing dust? We’ve not had many scenic views to share for the past several days – hoping to find something in the historic Route 66 sights tomorrow. Thru the porthole at Cottonwoods Campground in Canyon de Chelly. Turquoise Trail was not a view I want to remember, so….no photo from that campground. 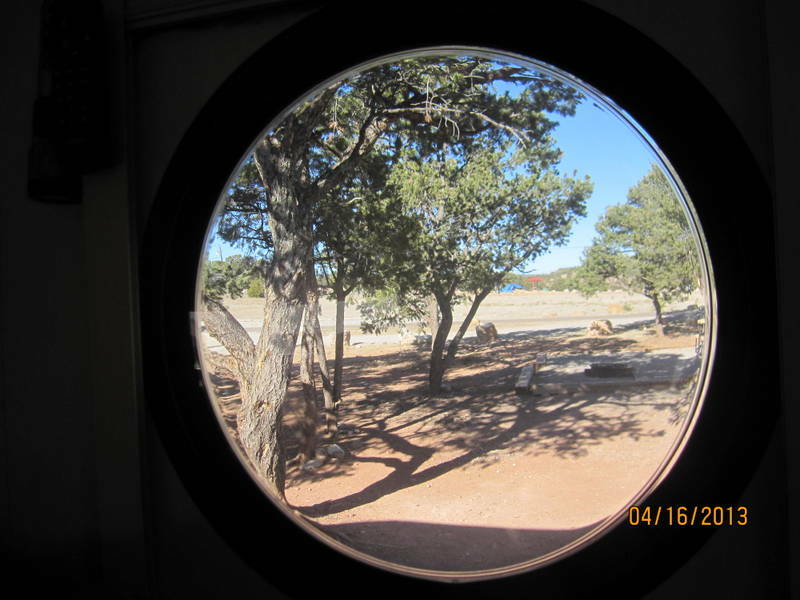 This entry was posted in great outdoors, New Mexico, retirement, RV life, simple camping, T@DA, weather and tagged camping, New Mexico, retirement, road trip, RV life, simple camping, T@DA, weather by Judy Crankshaw. Bookmark the permalink. I have read Worst Hard Time – just didn’t occur to me that it continued on to this day. The Fireball is carrying around about an extra 10 pounds of TX and NM red dust. We find it everywhere. Hope everyday we’re thru with it, but it just keeps on comin’ Thanks for checking in. we are going to have 30-40 MPH winds here tomorrow. thanks for sending some our way….. I think it blew hard enough here yesterday that the winds you’re getting are the ones that passed us. It’s quiet this morning – hope it stays that way. Your weather is going to be ugly – batten down the hatches. I am afraid the wind would drive me stark raving mad. I’ve read stories about Pioneer women going crazy from the incessant wind. I also read about the extreme drought in the southwest. It breaks my heart. Georgia has just recovered from an extreme, multi-year drought. I forget how many millions of trees Texas lost last year. We woke up this morning to silence. Sometime in the middle of the night, the howling ceased. We’re crossing our fingers that it won’t return today. But, for now, the only noise is our feet padding across our gritty floor, and the grinding noise my keyboard makes! Gritty floors and grinding keyboard. The thought makes me cringe! Hope you are in for a long run of beautiful hiking and biking weather — finally!